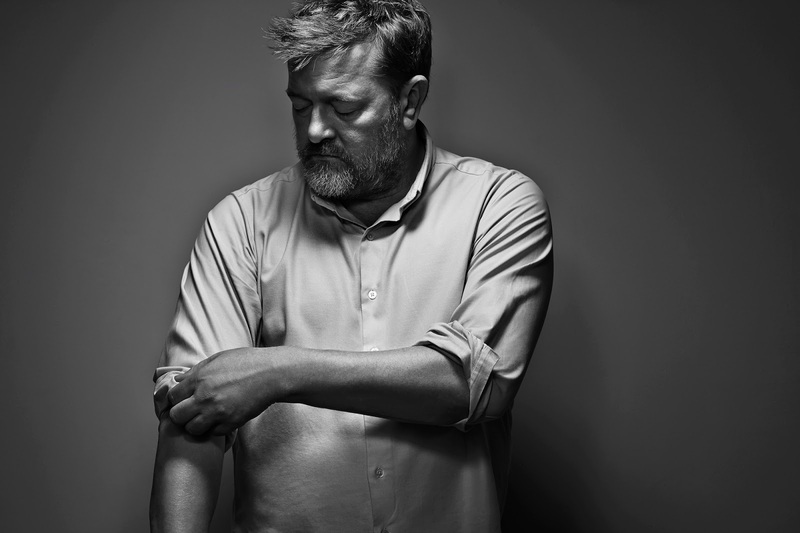 After nearly twenty five years and counting as a member of elbow and one of the UK’s most recognised and celebrated musicians and lyricists, Guy Garvey is setting off alone for the first time. On October 30th he releases his debut solo album, ‘Courting the Squall’. Recorded initially at Real World Studios near Bath and completed at Blueprint Studios in Salford, ‘Courting the Squall’ features a band created by Guy from his ‘favourite musicians outside elbow’ and was driven by spontaneity and experimentation amongst the assembled players with Guy firmly and exclusively in the driving seat. The band ‘moved fast and drank a lot’, focusing on live recording with minimal overdubs to create the songs. Unlike elbow, where democracy has always ruled, this is an album where Guy embraced the freedom to do exactly what he felt throughout. The album features Pete Jobson, long time friend and bass player from I Am Kloot, as lead guitarist and Nathan Sudders from The Whip on bass, bringing an indie sensibility that was at the heart of Guy’s thinking for certain songs. Keyboards are marshalled by old V2 labelmate Ben Christophers and drums are filled by Alex Reeves. elbow’s brass section add to selected tracks whilst Rachael Gladwin, a steadying contrast to the party vibe of the team due her being pregnant, plays the harp and kora. ‘Courting the Squall’ is powered by influences and ideas that ‘don’t fit the elbow template’. Some tracks, notably ‘Angela’s Eyes’, ‘Harder Edges’ and ‘Belly of the Whale’, come completely from groove, finding a sweet spot between Manchester’s baggy past, long term love Tom Waits and Bowie’s mid-70’s albums, particularly ‘Sound and Vision’. This change of type engendered a change of vocal approach, a clipped and more direct Garvey voice coming across, a hark back to his early days writing lyrics influenced by his listening to hip-hop where short delivery carries rhythm alongside meaning. Having guested on various artist’s albums as a vocalist, ‘Courting the Squall’ sees Guy duet on his own music again with the sumptuous ‘Electricity’ featuring Jolie Holland conjuring up images of illicit jazz dives in fin de siècle Paris or prohibition era New York in the distinctly non urban studio setting outside Bath. Alongside Jolie’s credit, another, less familiar set of co-writers appear on the album but we’ll leave that to you to discover. Yet not all of ‘Courting the Squall’ is a move away from the familiar. The album title track, a trip hop rhythm propelled ballad and ‘Juggernaut’, a hymnal clothed in sedate populist clothing, may feel more immediately recognizable to long term followers of Guy’s music whilst ‘Broken Bottles and Chandeliers’, with its warmth , once again showcases his unerring ability to translate the sense of overwhelming joy into understated musical form. It is, as with all solo albums, a glimpse into its creator’s soul. Shot through with warmth and emotional intelligence, content and comfortable in its own skin, ‘Courting the Squall’ is that most unique thing; a record made without preconditions, an album of songs made purely for the joy of its making. Guy has also announced a short run of dates in Europe and the UK throughout November and December on which he will be accompanied by the musicians who recorded the album, including Pete Jobson of I Am Kloot on guitar, Nathan Sudders of The Whip on bass and Alex Reeves on drums. Elbow’s brass section complete the live line-up. A special fan presale will commence at 9am on 16th September – simply follow the link at Facebook - https://www.facebook.com/GuyGarveyofficial. Tickets go on general sale at 10am on Friday 18th September. ‘Courting the Squall’ is released on Vinyl, CD and Download on 30th October 2015. Limited quantities of vinyl and CD feature a lenticular sleeve.